When they first started doing that Top Dance, I guess they selected an older person to do it, because if the feathers don’t fly off right, then either the performer or their relative would die, pass away, so they selected an older person. So it is kind of scary. During Kiavsaq, the Top Dance, a performer pulled the cord to spin an inverted top made from wood or the tip of a mountain sheep horn. Down feathers glued lightly to the top flew off into the air, signaling good whaling and hunting in the coming year. 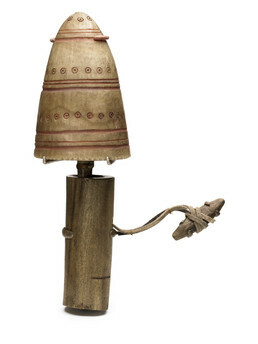 To learn more about the history of this object, read a report by Smithsonian conservators at http://anthropology.si.edu/accessinganthropology/alaska/gallery_top.html (copy and paste this address into your internet browser).